Elizabeth Gregory Home is a Seattle nonprofit whose goal is to transition homeless women off the streets using housing and a day center. They offer dignity and inspiration to all women in the Seattle area—helping them search for jobs, cook a meal that suits their needs, and connect with friends, family and employers through use of the internet and phones. All in a safe, welcoming environment. Elizabeth Gregory Home needed to connect better with donors. 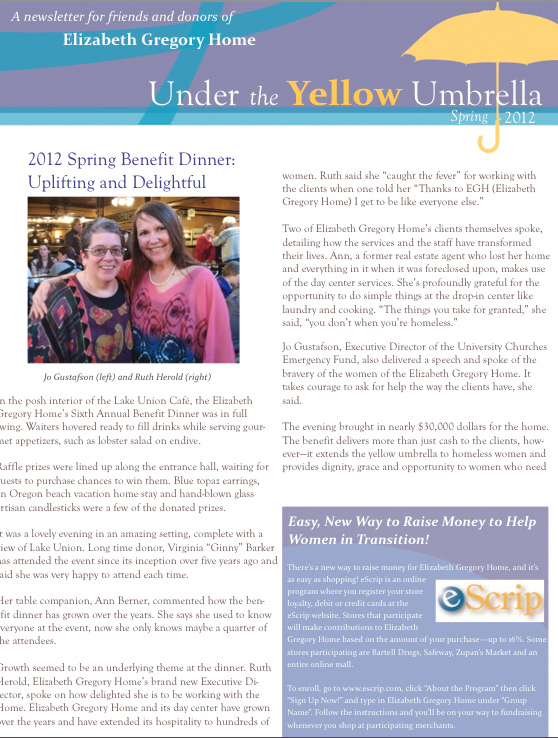 Their old newsletter and annual report had a dated feel and needed to reflect the immense good EGH does for homeless and at-risk women. More info about their mission, and how to connect with them through their channels, as well as how to donate and volunteer, were necessary. They were also missing opportunities to highlight what made them unique—one factor being EGH warmly welcomed trans women. Donors, especially Seattle-area donors, would appreciate and click with many of these differentiators. 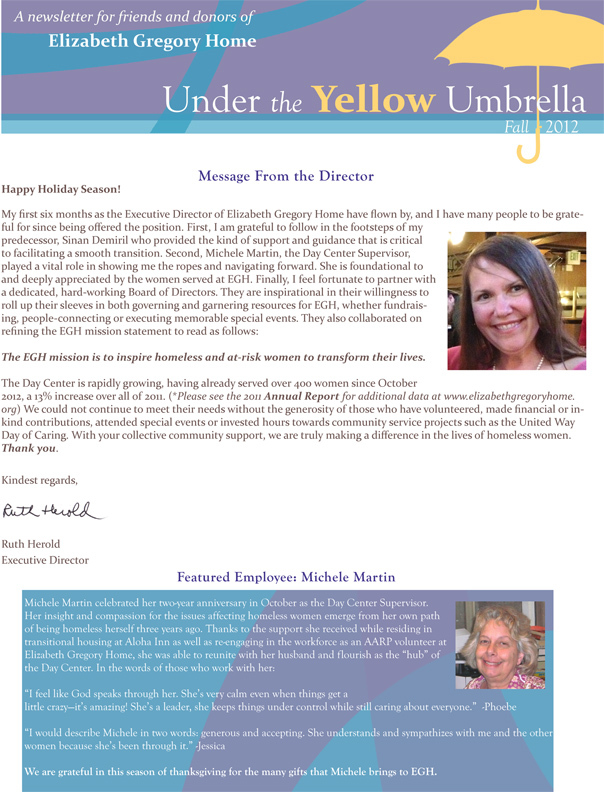 After speaking extensively with the Executive Director, interviewing many of the women at the drop-in center, and researching who the key audience was in the area, I went to work updating their newsletter and annual report. For the newsletter content, I wrote the stories of women EGH successfully transitioned into housing, and focused on their personal stories. I developed more articles highlighting Elizabeth Gregory Home’s differentiators, such as their acceptance of trans women and their dedicated employees—one of whom was homeless once herself. I interviewed Danielle Askini, then of the Ingersoll Gender Center, to better understand the challenges trans women face and why places like EGH matter so much. I created and laid out all new graphics for the collateral. I also made the font bigger and inserted more white space so key demographics could better experience the content. On the back I included their channels and how donors could contribute to EGH. 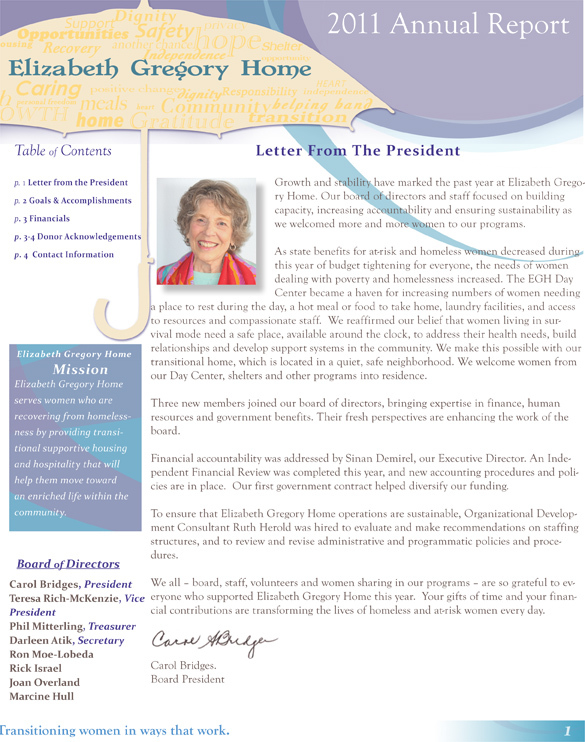 The new newsletter highlighted the excellent work Elizabeth Gregory Home does, and invited donors to be involved with the work. Erica Mills of Claxon Marketing featured the newsletter in her panel, Nonprofit Marketing Makeovers, at the 2012 Washington State Nonprofit Conference as an example of well-done donor-facing collateral. How Can I Improve Your Organization?